TORONTO: Top Canadian leaders, including ministers, MPs, MPPs and mayors, will join the Indo-Canadian community in celebrating India’s 69th Independence Day at Yonge and Dundas Square in downtown Toronto on Sunday, August 16. The biggest event of the community draws thousands of people to the colourful parade and subsequent cultural performances showcasing India’s diversity in dance, music and culture. Toronto singer Shirsha Chakaroborty will be the lead performer this year. Apart the colourfully decorated rickshaws, another unique feature of the India Day parade this year will be a 12-member military band led by Lt Col (Hon) Hari Panday. Panday is the only corporate honcho of Indian origin in Canada who dons the military uniform. The day-long celebrations will begin with the singing of the National Anthem and patriotic songs. It will be followed by the downtown grand parade comprising VIPs and contingents of different Indian states. After the parade winds up back at Yonge and Dundas Square, the high-voltage cultural show will unfold. About three dozen cultural troupes and individual performances will showcase India’s rich and diverse cultural heritage non-stop till 8pm. Over the years, Indian cuisine at the India Day celebrations has become a big draw for families. This year too, more than two dozen food vendors will treat visitors to an array of Indian delicacies idli, dosa, chat papri, biryani, tandoori and other ethnic dishes. Ethnic Indian products will also be on sale at the venue. There will be prizes and certificates for the largest and the most ethnic among state contingents. 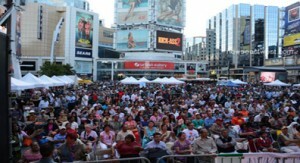 Yonge Dundas Square can accommodate up to 26 vendors with several sponsorship opportunities. 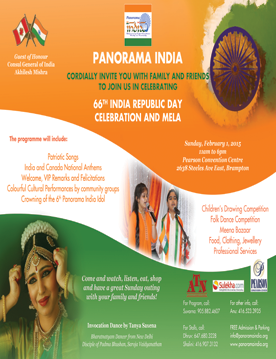 Vendors looking for a booth and those wishing to join cultural performances or register for the parade can contact info@panoramaindia.org. 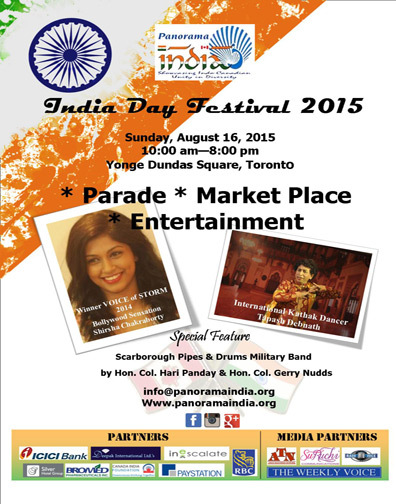 ICICI Bank will be the lead sponsor of this year’s India Day Festival. 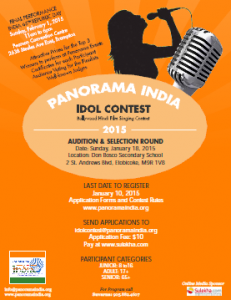 TORONTO: Panorama India, which is an independent umbrella organization of various cutural and social bodies of Indo-Canadians, has announced some brand-new initiatives to enlarge its imprint in the New Year, according to its chief Anu Srivastava. 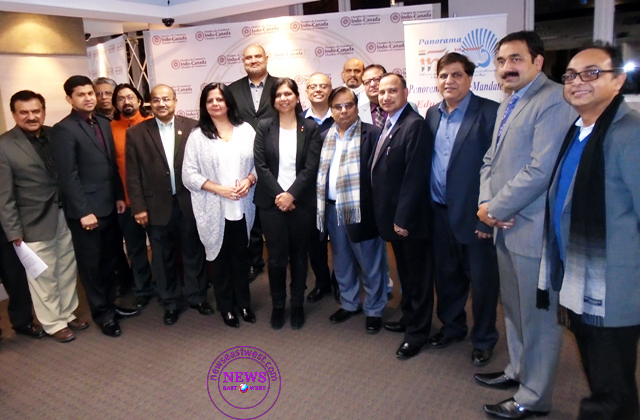 Recognition of Ind0-Canadian organizations and their leaders at the major Panorama India events is one such initiative in the New Year. Srivastava says she and her fellow board members â€œintend to lead Panorama India to the next level and work with dedication and sincerity in meeting its objectives,â€™â€™ in the New Year.. 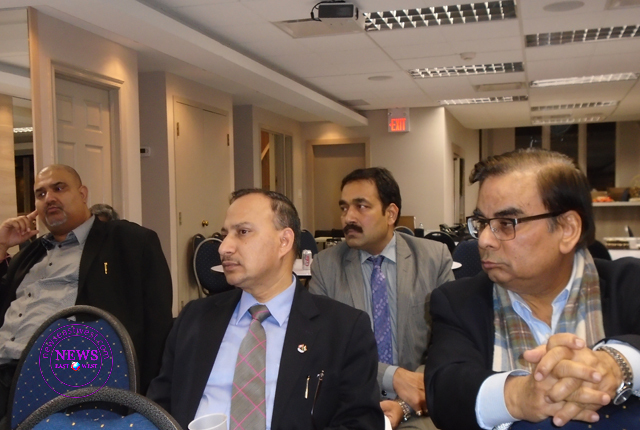 Giving out details of various past and future activities at the just concluded annual general meeting, she said Panorama India would keep up its critical role in furthering Indo-Canada relations by showcasing the Indian diasporaâ€™s diversity and achievements in Canada by organizing various events. Among the major events organized by Panorama India are the Indian Independence Day parade, the Republic Day celebrations and Diwali celebrations at Queenâ€™s Park. Looking at the accomplishments of the premier Indian organization in the year gone by, Anu Srivastava, who took over as Panorama India chairperson eight months ago, said, â€œAs we look back upon 2014 it certainly has been a year of challenges, changes, transition and yet some of our biggest achievements too. HSBC is likely to Panorama Indiaâ€™s lead sponsor for India Republic Day celebrations. The bank will sponsor the community reception and recognition of one community organization for its services. â€œFurther Panorama India has re-initiated sponsorship discussions with ICICI Bank and State Bank of India which had been put on hold for almost 2 years. And we continue to work with CIBC for their ongoing support,â€™â€™ Anu Srivastva said.